Tag Archive | "floor/theater Center"
Madre Tierre is a small Ecuador hotel in Vilcabamba. Here is the entrance to this small Ecuador hotel. We have been sharing this series on Small Ecuador Hotels. There is an Ecuador small hotel business opportunity in Vilcabamba now. This message reviews this opportunity in a moment. First, the subject of Social Security rules about working and owning a business abroad (that could reduce Social Security) and Ecuador’s new asset reporting regulation has sent many of you to the keyboard! Yesterday’s message on Ecuador & Privacy raised many questions that I cannot answer personally. As a financial publisher I cannot give individual legal or investing advice. In the 1980s, my husband was working for an American corporation in Saudi. One incentive – at least back in the day – was that income earned there was exempt from US taxes unless the employee broke the contract and left early. I realize that the situation of being an employee is different from being a business owner or being self-employed. And I have no idea whether the arrangement described above applied to all US companies or some (the corporation in question was Bechtel). That said, if earnings are taxed in the country where they are earned and then taxed again in the country of residence or citizenship, this constitutes double taxation – kind of like getting taxed on your income tax refund. Do your tax experts have any comments on whether international law allows or prohibits double taxation? The answer is that there are tax treaties between the US and many countries, including Ecuador, so if you reside outside the US and are under another tax jurisdiction in another country, then you do not have to pay double tax. In many instances there are even tax benefits… called the Foreign Earned Income Exclusion. The IRS code says: If you are a U.S. citizen or a resident alien of the United States and you live abroad, you are taxed on your worldwide income. However, you may qualify to exclude from income up to $87,600 of your foreign earnings. In addition, you can exclude or deduct certain foreign housing amounts. There can be even greater tax benefits when you have a correctly structured business abroad. This is explained in the tax portion of our Tangled Web… How to Have an Overseas Business course. Joe Cox wrote the tax portion for me and the excerpt below explains how the benefit can be achieved. Over the duration of this course we will review all of these structures and when each works best. But whenever it is possible to attain, the seventh structure is always the best from a tax point of view. This generally is the best from a business point of view as well because it means you have someone abroad helping you with your business. Merri’s and my new business in Ecuador was this situation. We created a business using partners who will help us build the center, run it and provide the valuable knowledge. This assistance is invaluable. We could not do this business (which I believe will so well as do good for the clients and community) without their help and involvement. more by non-U.S. persons pays no U.S. tax. Such a company does not have to even file a U.S. tax return. This is a complicated law, filled with land mines and I would not hope to understand or explain it all. Instead in this lesson I have asked my tax attorney to explain the legal aspects of this tax law. I will add my comments along the way to help you understand more in lay terms. Essentially CFC law aims at stopping investors from putting money into an overseas corporation and not paying tax. This is because in general overseas corporations that do not do business in the U.S., do not have to file with the IRS and never owe U.S. tax. Subpart F of the Internal Revenue Code aims to stop investors from simply putting capital and investments in overseas companies and thus avoiding tax on the income from these investments. Essentially the law creates three concepts. First, it creates the concept that income such as rents, royalties, interest, dividends and portfolio income are unearned and are different from income earned by business activities in a company. American. An American is any U.S. citizen, green card holder or resident. American, then that American has a personal tax liability on parts of the unearned income earned by that overseas company. You can see in Joe’s outline below as he clarifies the specifics in great detail. Foreign Corporation Tax Issues by JOE B. COX, ESQ. 1. The principal purpose of Subpart F of the Internal Revenue Code (IRC) is to frustrate U.S. taxpayers’ attempts to defer the U.S. tax on income falling within Subpart F.
2. Generally, Subpart-F income is “portable” income, which can be manipulated by U.S.
Taxpayers through the use of foreign corporations. Gary’s Comments: This is one of the most interesting areas of tax law for the international businessperson. This outline will explain why sharing my business with Ecuadorians will create a tax paradise. Do not be confused. Income tax planning does not necessarily create good Social Security planning. If you have not reviewed your Social Security regulations and you plan to live and work abroad… see a tax attorney about this. I have reviewed these rules with both my attorneys in the US and Ecuador. My US attorney and very good friend, Joe Cox wrote: Gary, I have set it up so my personal assistant April Barza can answer calls and e-mails and schedule a no obligation, no fee conference call on the questions that come out of your newsletter or seminar. I would not want to give the government of Ecuador a listing of my international holdings. I would think they would have no security with that information. Joe. 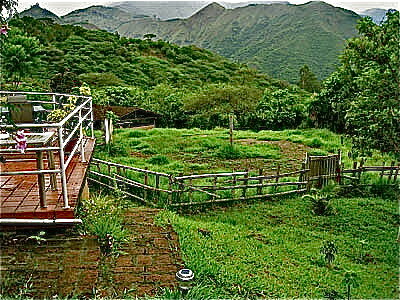 Back to small Ecuador hotel opportunity in Vilcabamba. Recent messages have looked at Vilcabamba real estate. When we began investigating Ecuador back in the mid 1990s. Joseph Garzozi, the Ecuador Economic Consul in Miami was one of the first people we visited. One of the places he recommended we visit was the village of Vilcabamba. 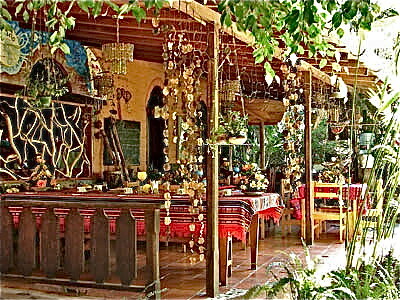 The Madre Tierra restaurant at this small Ecuador hotel. I researched this Ecuador village and became fascinated with the fact that some of the residents there lived to extreme ages. Further research brought us to an article written in the January 1973 National Geographic entitled, “Every Day Over 100 is a Gift” written by Dr. Alexander Leaf. This article was written about the three valleys-one in Georgia (then USSR), one in Pakistan (Hunza) and the valley of Vilcabamba, where 1,080 people per 100,000 lived on average to be 100. The article compared this to three per 100,000 in the United States. More important those who reached a ripe age (even over 100) remained vital, sexually active, still work and participate regularly in the community. This greatly peaked our curiosity and we started looking for ways to visit this valley. This was easier said then done. One reason the population was long lived was because they were isolated from the rest of society. Few people knew how to get to Vilcabamba. Finally we found a national guide, Eduardo Quito, who could take us. We flew to Cuenca where we met Eduardo and then drove south along the Andes for an entire day to Loja. A Quito Loja flight would have been faster but we wanted to see this part of the world. We spent the night in Loja and Eduardo drove us next day to Vilcabamba where we stayed at a small hotel, Madre Tierra. This small Ecuador hotel was owned at that time by an Ecuadorian, Jaime Espinosa and his French Canadian wife. Madre Tierra was a popular spot for Israelis and other backpackers hiking along the Gringo Trail at that time. There was a sign in Hebrew Letters that said “Shalom, Jaime’s Hideaway” and the room rate then was $9.00 per night for Israelis and $10 to $15 for all others. The rooms were little thatched cottages sprawling down a steep hillside with rich gardens and killer views. Breakfast and dinner were served on the terrace. Backpackers were not very profitable guests. It is hard to develop much revenue with $9 a night rooms. Jaime and his wife were in the process of creating a spa. They had just installed a spa, massage room, hot tub, steam and clay baths and special cold and water accupressure treatment. They hired us to consult with them about how to upgrade their market so we spent an enjoyable day talking, thinking about how to get a higher grade of guest and enjoying the spa. After working with the couple we headed back to Cuenca fully expecting to return to Vilcabamba with a group. Then as the saying goes, “life happened.” Vilcabamba is remote… an extra day’s journey when reaching Ecuador and this spectacular valley never worked into our plans. However Vilcabamba did take off and we hear from many readers that they are moving or have moved to Vilcabamba. We also heard that a retired actor and his wife had purchased this small Ecuador hotel. Due to this background and the fact I am always looking for ways that readers can earn income in Ecuador, I perked up when I received the note below. This wasn’t an emergency until TODAY…as a family member has to go in for surgery tomorrow morning. I do not want to handle the stress of anything else right now. So I’m writing to tell YOU that we’d even be willing to sell both properties for the price of one. In other words, this has suddenly become an illness, desperation emergency sale. 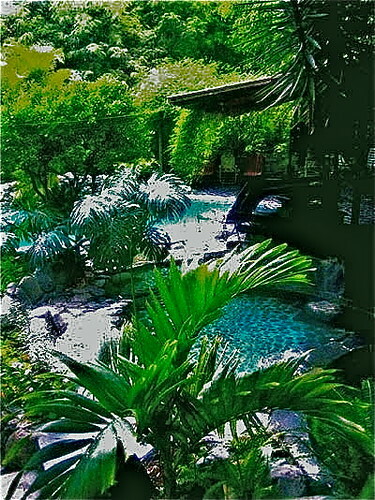 Here is the spa in this small Vilcabamba hotel. Our six acre home/mansion with the most spectacular views of all time has three craftsman fabulous guest houses and stables, etc. We are selling the 43 hectare farm that has a 360 degree view mansion and worker house and a working sugar cane factory, etc. View of the farm from the house. We’ll take an offer from you or anyone and will offer a discount to any reader who comes down and stays at the hotel. additional water sources available, too, and so much more. 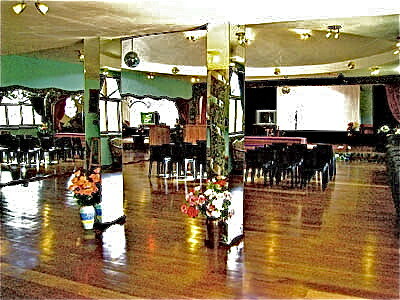 Madre Tierra conference room and theater. Thank you for all you do for others and the world. Much love to you both, Carol Rosin. As mentioned I have not been to Vilcabamba nor Madre Tierra for at least 15 years. A lot appears to have changed and Madre Tierra appears to have dramatically upgraded its market. This offers an opportunity for readers who live in or are thinking of moving to Vilcabama and want a business. The seller offered a commission and we explained we do not accept commissions so this savings may help this make this a better deal for our Ecuador Living subscribers. You read a full report on this offer with contact details as an Ecuador Living subscriber. I have no updated knowledge of the property, income, profit and any buyer should use all normal due diligence in looking at this offer.